Magna Carta matters! And mattered then, not just now for its symbolic assertion of the collective rule of law over arbitrary diktat. The Magna Carta was an important early 13th C milestone within the long emergence and development of the revolutionary British liberal-democratic governing model, a process arguably going back to the practices of the Germanic Anglo-Saxon tribes or peoples which settled there in the wake of Rome’s retreat, but which did not meaningfully conclude till over 700 years later in the 20th C, eg 1918 when women finally got the vote there! Moreover this revolutionary constitutional development arguably also impacted materially on Britain being where the Industrial Revolution finally kicked off in the mid 18thC, c1750, perhaps the single most profound shift in humankind’s collective global circumstances since its evolutionary separation from other primates millions of years ago, now utterly transformative for man’s material living conditions, and also his knowledge of his universal material world. The Magna Carta (Great Charter) matters today mainly for its powerful global symbolic assertion of the rule of reason-based collectively determined law over arbitrary rule by a monarch or clique in their name or the name of some invoked divine entity. However MC, in its various versions, was also important in its time, and remains a major milestone in Britain’s historic liberal democratic constitutional development. It followed (and drew on) the important 1100 Coronation Charter of Henry I and was a milestone document in the ongoing circumscribing of arbitrary English monarchical rule, and arguably the single most important such document. Ironically King John’s immediate rejection of the Charter he sealed 15th June 1215 only reinforced its significance, because soon after it was reissued to help secure support for Henry III from equivocating English nobles, and to help extract taxes. To these ends it was reissued a number of times (1216, 1217, 1225, and 1297), and reconfirmed many times. John’s resistance also raises one of the more interesting “counterfactuals” in English history: what if he had not died suddenly in October 1216, aged 50. The then French pretender Prince Louis (later King Louis VIII of France), supported by rebel “English” nobles, came close to prevailing. The MC has since became famous especially because it was powerfully invoked by the English parliament in 17th C in its epically consequential struggle with an intransigent and refractory king Charles I, trying to turn back the clock and rule for himself and God, and then because the MC’s application in these circumstances was exported to and took root in the US, which, whatever its faults, has grown into by far the most powerful effective democracy in the world. While little of MC’s specific content is retained “on the books”, much of this specific content still resonates loudly today. Meanwhile… Does MC have any cousins somewhere in the rest of Europe? King John is shown where to “sign” (ie seal)…. The idea of “politics”, of convened meetings between relevant parties in a political entity (some kind of community, a tribe or clan or city) goes far back, possibly to old Mesopotamia but certainly ay to ancient Athens, around 500BC, when an Assembly, or Ecclesia, met on the Pnyx, a hill in central Athens, 40 times a year and attended by male citizens over 18. Decisions were taken by a majority show of hands vote. The Roman Republic, founded around 509 BC, was ruled by two elected Consuls, who acted on the advice of a Senatus or council of elders, comprising 300 drawn from wealthy and noble families. The British Parliament has its origins in two early Anglo-Saxon assemblies, the Witenagemot (Witan) and the moots. The Witan dated back to the 8th C and advised the King on royal grants of land, taxation, defence and foreign policy. It did not have a permanent membership, made up of advisors and nobles who met when called by the King. The Witan had no power to make laws, but the King was careful to consult because ultimately he relied on the nobles support to rule. After the Norman Conquest William ruled with the help of a much smaller but permanent group of advisers known as the Curia Regis (the King’s Council), consisting of noblemen and church leaders appointed by the King. Like the Witan, the CR only offered advice. The King also sometimes consulted a larger group of nobles and churchmen known as the Great Council (magnum concilium). Over time, the Great Council evolved into the House of Lords. The moots were local assemblies held in each county (or shire) to discuss local issues and hear legal cases. They were made up of local lords, bishops, the sheriff and four representatives from each village in the shire. The practice of local representatives making decisions for their community eventually led to the creation of the House of Commons. The 1215 document was sealed on 15 June 1215 at Runnymede, south bank of the Thames about 6km from Windsor and now smack in the Heathrow flightpath. 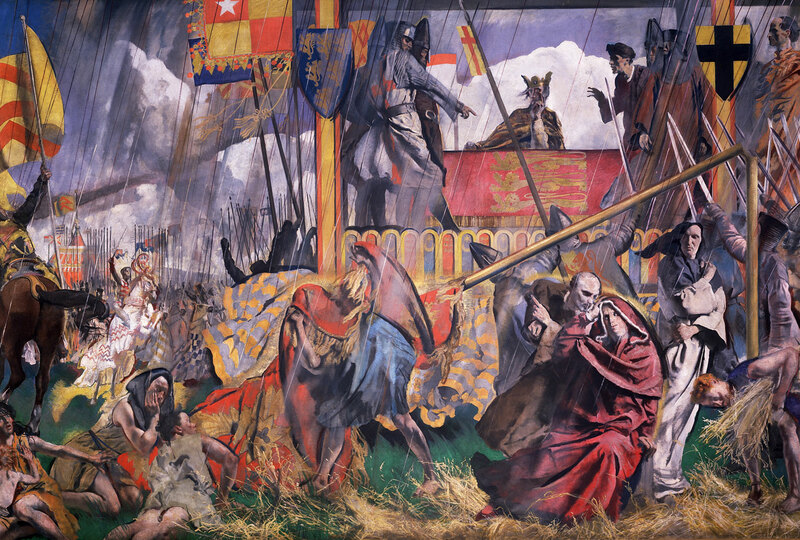 Stephen Langton, Archbishop of Canterbury, supervised talks between the rival sides, the irate barons and King John. The Angevin king John was the youngest son of the long reigning (45 years, 1154-89) Henry II who had ruled generally well following near two decades of the Anarchy (1135-54) caused by the competent Henry I (ruled 35 years) dying 1135 leaving no male heir, his son William having drowned 1120 when the White Ship sank. John’s father was Henry I’s grandson via daughter Matilda who had married Geoffrey of Anjou. Henry II’s main and important achievement was strengthening law and order, and he also kept the lid on his large but unsteady Anglo-French Angevin Empire the king. His eldest surviving son Richard I (Lionheart) ruled only 10 years, not badly but wasted time and money crusading, and also left no heir. John, 10 years younger than his brother, quickly lost Normandy (1204) and spent the rest of his rule trying to reclaim it, finally losing the important Battle of Bouvines. John’s nickname “Lackland” played on his important foreign policy failure. The Bouvines defeat July 1214 triggered the historic confrontation between monarch and barons, who were angry over money extracted by John to pay for pointless wars in France, and also with his ill-tempered arbitrary attacks on barons, in the Angevin tradition of ira et malevolentia (“anger and ill-will”), building on the Norman concept of malevolentia (“ill-will”), deemed a royal right to punish fractious nobles or clergy, reflecting the royal prerogative of vis et voluntas (force and will). Henry II had got away with this because his reign was generally competent. The barons were now in open rebellion in 1215, making an oath in January they would “stand fast for the liberty of the church and the realm“, demanding first John would confirm the 1100 Charter of Liberties. Negotiations with John ensued, the barons entering London on 10th June, ie with London’s support. Finally John sealed the Charter of Runnymede, or the “Articles of the Barons on June 15th. Copies were quickly dispatched around the kingdom. The new charter was not a novel idea but drew on a by then important tradition rejecting arbitrary royal rule in favour of a rule of law agreed among the main parties: monarch, barons and clergy, a tradition arguably rooted in customs of the Germanic Anglo-Saxon tribes which settled in England from 5th C. Thus it drew directly on the 1100 Charter of Liberties (Coronation Charter) agreed by Henry I on his accession (after older brother William II (Rufus) had died hunting) to placate, gain support of barons and church offended by abuses during William’s rule. But the 1215 charter and its subsequent variations arguably comprise an important milestone in Britain’s constitutional history, and hence the world’s. The new Charter was immediately revoked by John, and at his request smartly annulled by a Papal Bull (by Innocent III, who May 1213 settled a dispute with John) the same year, 24th August. But ironically John’s resistance served to reinforce the importance of the new charter as the country now slipped into an important civil war since some barons had invited the heir to the French throne (son of Philip II Augustus who had defeated John at Bouvines), Prince Louis, to press a claim to the English throne. Crucially John died October 2016 (of dysentery, age 50) and some “English” rebel nobles now abandoned Louis to join the cause of the elderly famous knight William Marshal (then 69! ), who was appointed regent to enforce the accession of John’s young (9 years) son as Henry III, supported keenly by the papal legate Cardinal Guala Bicchieri, backed by Pope Honorius. Henry was crowned at Gloucester 28th October 1216 but while much of England till leaned to Louis. To help persuade rebel nobles to switch Marshall and Cardinal Guala Bicchieri issued a revised 42 clause Charter of Liberties on 12th November 1216, omitting the controversial Clause 61, and others disliked by the Papacy. Though this did not help much? And “opposition to Henry’s new government hardened”. February 1217 Louis returned to France for reinforcements and Cardinal Guala now declared Henry’s war against Louis “a religious crusade”, which did cost Louis support? Louis returned end April 1217, but now made a tactical military error, splitting his forces between Lincoln in the north and an attempt to capture Dover Castle in the south. So Marshal now focussed on attacking Louis at Lincoln, and on 20th May 1217 his side prevailed, “entering through a side gate, he took the city in a sequence of fierce street battles and sacked the buildings… historian David Carpenter considers the battle… “one of the most decisive in English history””. The tide turned. Louis began negotiations with Guala, which stumbled and fighting resumed. But a French fleet arriving with soldiers and supplies 24th August off the coast of Sandwich was defeated and finally forced Louis to submit at the Treaty of Lambeth (12-13th September) in return for a 10,000 mark payment, and and amnesty for the English rebels. Louis later ruled France 1223-26, persecuting Jews and joining the Albigensian Crusade south in Languedoc. Henry’s accession meant Louis did not quite foreshadow the successful Glorious Revolution of 1688! What if John had not died then? Because even then Louis, an experienced soldier, was not easily defeated. If having got the upper hand by late 1216 Louis had waited for reinforements from France then had met Henry’s forces under Marshall perhaps he would have prevailed, bearing in mind many of the English nobles were part French, and holding lands in France. In the wake of the unrest restoring royal authority under Henry now was not easy,not helped when Marshal died May 1219. The country’s law and order system was now frayed. To help Henry’s cause the Charter was reissued in 1217, now expanded to 47 clauses, and now together with a Charter of the Forest which contained rights for commoners to access public land. In 1225, yet again compelled by the need to raise money, and yet again to fight across the Channel trying to keep / restore lands there, the new king gained tax sum of Stg40k by agreeing to reissue and confirm the two Charters, the Great Charter (now trimmed to 37 clauses and the first charter to enter English law?) and the Charter of the Forest. And importantly he declared them reissued of his own “spontaneous and free will”. In 1237 “Little Charter” (Carta Parva) was issued and both the 1225 Charters were confirmed and granted in perpetuity. A later 1297 version (Confirmation of Charters) was issued by Edward I in return for a new tax. It was written in Latin, about 3550 words, but quickly translated to French, but not English until 1534. Between the 13h and 15th centuries the Charters would be reconfirmed many times.. But his reign is not well regarded? Henry III ruled a long 56 years, till 1272, and badly, it is generally agreed, for the usual reasons of wasting a lot of money on failed offshore foreign policy failures (including an expensive attempt to install son Edmund on the throne of Sicily! ), thus offending the barons, and all “tax payers” (especially the Jews, who were specifically “taxed” by Henry), and also for backing, favouring his unpopular Poitevin half brothers, the Lusignans. Barons revolted in 1232, in 1258 (forcing reform through the Provisions of Oxford) and again in 1263, now led by Simon de Montfort. Montfort died at Evesham in 1264, fighting Henry’s son Edward, but had caused important advances in the emergence of parliament, especially by spreading its recruitment to include “county knights and burgesses”, or “commoners”. Three Edwards: two wins, one dud. Edward succeeded his father, as Edward I, ruled 35 years to 1307, and ruled well. He was competent, bright and tough, winning his wars (especially in Britain, against the Welsh and the Scots) and overseeing important reform of the legal system. His son however was the hapless Edward II, ruled 19 years to 1327, losing at Bannockburn to the Scots, offending and arouing the barons, who finally deposed (and killed) him. Some sense returned with his son Edward III, “tall and handsome like his grandfather”, who ruled a long 50 years till 1377. Also thanks again to the need to raise funds to fight the French (kicking off the 100 Years War in 1337, actually 115 years, to 1453) there were important advances in the governing relevance of the English parliament. “From 1327 the people’s representatives sat in Parliament permanently and by 1332 were referred to as the House of Commons. The British Parliament now comprised 3 familiar elements: the monarch, the House of Commons and the House of Lords… [but] no formal meeting schedule… called at the request of the King…. until this time, the House of Lords had far more influence… However 1341 the House of Commons began meeting independently…..became practice for the King to seek the approval of the Commons for new taxes….. ongoing conflict with France meant King Edward III (1312 -1377) was forced to summon the Parliament more frequently…” Edward started his French military odyssey well (eg Crecy in 1346), but despite his ability lost much ground late in his reign. The MC was not a visionary “motherhood” Mission Statement but rather was quite specific, through 63 clauses or chapters. However this detail meant its overall thrust was to strongly reinforce, and crucially delineate, a tradition now going back centuries, of a monarch consulting with representatives of the people in the determination of rights and laws. Thus it also reinforced England’s important courts-focused common law tradition, already encouraged by both Henry I and Henry II, and also, ironically, by John, given credit for improving during his reign the administration of justice. 4/ cannot sell justice, ie an independent untainted judiciary (Chap.40). 5/ freedom of movement (Chaps 41 and 42). 7/ in general, the rule of law, and law derives from “people” NOT the king or God! In particular the franchise of the Charter was very limited, did not apply equally to all, rather only to a privileged small minority, and certainly not to women. Thus it was “result of an intra-elite struggle, in which the nobles were chiefly concerned with their own privileges.” It was a step in a very long journey, albeit an important step. Why did this document become famous? Revered? Then it became famous when invoked by Edward Coke in 17th C in parliament’s fight with Charles I. It became an important “rallying cry”. Based on this elevated attention it then crossed the Atlantic to become important in the US, more even than in England? It “became an American icon”. Did it work? Does it matter? Yes! It matters (especially through the English-speaking world) less for its actual text than for its powerful general support for the principles of the rule of law and this law being determined not by a king invoking God’s name but by consultation with his people. However there is a wider debate. “Does liberty depend on some deliberate fragmentation of power at the centre?” The Whig view of history. Does MC have any cousins somewhere in the rest of Europe? Or does it reflect the peculiar history of constitutional development in England? Pre-Raphaelite Brotherhood… nostalgic if entertaining crackpots: looking through wrong end of the telescope? Oddly reactionary, Romantic, nostalgic, Mediaeval-revivalist (?!) 19th C (1848) British movement, when Britain & its Empire at forefront of the economic earthquake that was the Industrial Revolution. In stark contrast to the momentous Modernist art revolution then commencing in France. One country ran away from the New World, other embraced it. But PRB was but one facet of general British 19th C escapist artistic reaction: eg along with Aestheticism and Gothic revival! Summary: Romantic throwbacks? If entertaining. The PreRaphaelites I have never liked. A very odd bunch! Basically throwbacks, nostalgic, deluded Romantic dreamers, looking back from a booming mid 19th C Victorian England – when the pivotal Industrial Revolution, and the British Empire, were in full swing – to a fanciful elaborate escape into the long ago. Like many Left supporters today, they were safe from the material travails of the poorer masses, mostly self-indulgent (selfish?) „middle-class“ Elitists. They were a product of the rise of Romanticism which began late 18th C, as reaction to Reason / Enlightenment / the Science Revolution, then to the vulgar Industrial Revolution. But they were a harmless entertaining indulgence, while later in the 19th C Romanticism on the Continent had far more serious consequences when it spilled over into an intolerant visceral Nationalism, infecting extremist German thinking (after Bismarck unified G), lapped up by the Nationalist loonies who morphed into the Nazi movement. Summary: out of step with a revolutionary age! There is a head-shaking almost unfathomable irony in how the PRB saw themselves as reformist! Rebuffing the „Sloshua“ Reynolds inspired Royal Academy (f 1768), the Establishment. But in the very year (1848) of political revolts across Continental Europe – and of Marx’s portentous Communist Manifesto! – they launched a perversely reactionary movement, revolutionary only in old sense of circling back. There was hypocritical irony too how they were patronised by the offending – but wealthy! – new industrialists! Like Thomas Fairbairn. The latest (2012/13) big Tate show (the last in 1984) tried a revamp, a new look, but perverted the truth to sell tickets, way off beam? Billing them quite misleadingly as Avant-garde, implying Modernist progress? Thus they claimed the PRB: „.. self-consciously overturned orthodoxy and established a new benchmark for modern painting and design“ (Tate), But rather, in „futile evangelism”, they were A-G only in the tautological sense that they were contemporary, most certainly not A-G in terms of being new. In fact they were the opposite. Astonishing in hindsight. Here Britain was literally leading the world on the biggest change in man’s collective economic relationships since the dawn of the agricultural revolution about 10 millenia earlier, when man finally abandoned millions of years of hunting & gathering and settled down, cropping and pasturing. So the Ind Rev was in full swing, set, despite the casualties, to transform material prosperity for the masses –and to profoudly transform Man’s scientific undertsanding of his world – but this „radical“ sensitive young bunch of British artists (mostly) looked longingly backwards! In fact, casting a wider net, not one British artist in the 19th C made a contribution to the Modernist cause. Not until c1910 we see any Modernist signs? In stark contrast, across La Manche, the young guns in France embraced the New World, the ‚Modern‘, pursued open-eyed realism, and Social Realism, esp in country landscapes and life, and in the cities, thus JB Corot and Millet, then especially Gustav Courbet, the pioneering prologue to the portraits and urban genre paintings of Manet, thence Monet /Renoir /Pissarro etc and Impressionism, and the unfolding revolution beyond: the platform for the 20th C explosion. And also striking: this obvious observation was unremarked by ALL reviews I read of this show. Meantime England marched on backwards, into the Art and Craft movement of Wm Morris? All decorative, Mediaeval etc. Which then influenced Symbolism? Especially via spiritual dimension, dreams etc. Formation. A group of young guns (oldest 23! Though Millais was painting for 10 yrs by then) reacted to, rebelled against the British art Establishment, ie esp the RA and the Joshua Reynolds platform, which praised the high Ren, as the pinnacle of Art. So they formed in 1848, chose name PRB (and used this monogram on paintings), a 7 man group founded by WH Hunt, JE Millais, DG Rosseti, then joined by 4 more), a ‚Brotherhood‘, the PRB name partly in jest and apparently without great knowledge of the PR era (eg London’s Nat. Gallery was then sparse of PR art? Eg the Arnolfini Wedding, also L. Monaco’s altarpiece). They published a journal The Germ, recorded debates on PR Journal. FM Ford supported the group, shared its general ethos, but declined joining it. Promoted by important John Ruskin! Famous for championing JMW Turner. Eg 1851 defended them, generally shared their religious mindset, and became close to Millais, till M „ran off“ with his wife! 4/ were inspired by pre High Ren art. The PRB were influenced by earlier British painters William Dyce (1806-64), who worked with the Nazarenes, and also by Theodor von Holst (1810-44), pupil of Fuseli (1741-1825) and “a direct influence on Millais and Rossetti”. 2/ sought a return esp to Mediaeval and early Renaissance art, Quattrocento Italian art, the detail and colors. Thus their style favoured brighter light and colors, a keen detailed linear realism, flatter space. Eg obsessive detail of plants in JE M’s Ophelia. 3/ favoured realism, a close detailed observation of nature and life, but an idealistic / spiritual realism versus real (polemical, social) realism then famously abroad in France! Thus they were influenced by Van Eyck’s Arnolfini Wedding in London‘s Nat. Gallery, eg FM Brown. 3/ drew on Mediaeval literature, Dante, Boccaccio. 4/ and drew strong nostalgic spiritual succour from Christian narratives, from the legendary Arthurian England story (cf Malory), and from North Europe mythology! Celts. Nordic myths. Henry Wallis‘ The Stonebreaker (1857) is rare diversion to social realism? Apparently a „commentary on the (1834) Poor Law Amend’t Act .. which had formalised the workhouse system for paupers.”. But how sincere? Nods to Thomas Carlyle “nobility of the poor”? Like FM Brown’s “Work”. Relation to religion was complex? They revived pre-Reformation Christian simplicity? But they varied. Some were overtly religious, like WH Hunt. But Rossetti was agnostic, FM Brown a Christian Socialist? Thus his extraordinary Work (1852-65), a detailed decorative comment on the new economy, referencing Hogarth but without his edge! Also lot of paintings of women! Eg espRossetti. Why? Victorian repressed sexuality!? But their „attitude to women was more Pygmalion than progressive..” (A.Smart). PRB also took advantage of advances in chemistry, the availability of vibrant new pigments, artificial / synthetic colors. Note that photography emerging mid/late 19th C, mirrored the realism of PRB. Eg the woman Julia Margaret Cameron. Thus it also challenged /inspired / encouraged the PRB? Eg esp WH Hunt. PRB thinking resonated with energetic architect Augustus Pugin‘s (1812-52, died 40! Syphillis?) promotion of… Gothic revival! More rampant Med’lnostalgia! Eg Big Ben tower was based on his design. Overall, how radical / Modernist? They certainly assailed the RA orthodoxy, and in some ways they responded to changing world around them, but their „revolution“ was essentially regressive, running away, circling back, far back. Lots of portraits, people from religious, historical, literary sources but no real images of their world, the surging industry, the transformed country and cities, and people’s lives with it. Reception. First showings in 1849, esp JE M’s 1849 Isabella (or The Pot of Basil) (the 1st PRB painting? Citing Boccaccio’s crazy tale of blighted cross-class love, straight out of the mid 14th C), then 1850 controversy / uproar when Millais‘ Christ etc was shown, eg Dickens wild. But became very popular, well known. Because they were prolific, and striking and their nostalgia struck a chord. Some were knighted. Millais and Hunt are both buried st Pauls. Hunt’s Shadow of Death (1873) sold for 10,000 guineas! And was printed. And it still strikes a chord with the public! Still very popular, and for similar reasons? Nostalgic escapism? Thus JE M’s Ophelia is the Tate’s „best-selling postcard“! Duration. Short-lived movement? The original PRB lasted only about 5 years, dissolved by 1853? And fragmented. Thus the group then loosely split between 1/ Realists (Hunt, Millais), stressing nature, though Hunt stayed spiritual. Millais moved away after 1860,“adopting a much broader and looser style influenced by Reynolds”, and was thus abused by Morris, Rossetti etc! Who saw betrayal! And 2/ Mediaevalists (Rosseti, Burne-Jones etc). Rossetti went own way, now close to Wm Morris, worked with him, and Burne-Jones. Thus term „PRB“ conventionally covers the core work from 1848-53, from the 7 members, plus some later works by the PRB and by other sympathetic artists. Subsequently the PRB was related to, fed Aestheticism, another Escapist diversion, fleeing reality, which took root mid/late 19th C, esp based on lectures (1867/68) by philosopher Walter Pater, on the ideal of pursuing beauty in the arts, and favouring art for art’s sake, for its intrinsic beauty, and thus art NOT to be used for moral, sentimental or other messages. Thus they valued beauty over truth. Thus rejected Ruskin. Proponents, eg Rossetti, Burne-Jones (? ), Whistler, and Aubrey Beardsley. And the PRB spilled over into the Arts and Craft Movement, strong 1880-1910, esp Britain, but spread to Europe and N America. It was part of the Utopian reaction against Industrial Revolution. Thus they favored traditional decentralised manufacture, using Mediaeval / Romantic / folk motifs, versus modern factories and “machines“!? A&C also drew on the writings of Ruskin (eg frowned on „servile labor“ in factories, versus small scale independent workers, designing own goods). It was driven by Wm Morris (WM), joined by Burne-Jones at Oxford, part of the Birmingham Set, also inspired by Ruskin, and mad about Romantic literature (Tennyson, Keats, Shelley), and keen on social reform?? Much inspired by Mallory’s Morte d’Arthur. It became political for Morris, who by the early 1880s was „spending more of his time on socialist propaganda than on designing and making”?! Paradoical, thus WM a “Socialist” but looking backwards to his false Middle Ages paradise not forward to Marx’s workers revolution. And (cf BS) we see WM A&C influence in trade union banners! But had a big impact throughout Britain? Exhibitions, schools / education. Liberty & Co founded. Exhibitions. Big Tate 2012/13 show tried a revamp, a new look, but perverted the truth to sell tickets, way off beam, described them as Avant-garde but quite misleadingly, implying Modernist progressives? They were AG in self-evident or tautological sense that they were contemporary. But most certainly not AG in terms of progressing art. Tempting though because the PRB are an authentic British art movement, if in some sense an embarrassing one given events underway then across the Channel! Also the 2012/13 show was thin? BS: „of the 175 exhibits listed in the catalogue only 20 represent the five years of the Brotherhood’s existence”. BS Brian Sewell, WJ Waldemar Januszczak.